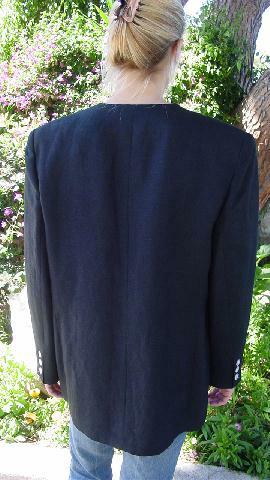 This black 60% linen and 40% rayon jacket is by Giorgio Sant'Angelo and was made in Egypt. It's collarless, double breasted, and has 4 large white iridescent buttons in the front and one black interior button. There are two lower horizontal slash pockets (one is still partially sewn shut). It has long sleeves with 3 buttons on each, and a breast pocket. There is a nice black 100% acetate lining and it has shoulder pads. It's from a stylist's personal collection. shoulder pad to shoulder pad 19 1/2"
shoulder to end of sleeve 24 1/2"
shoulder to hem 28 1/2"
side to side bottom hem 21 1/2"